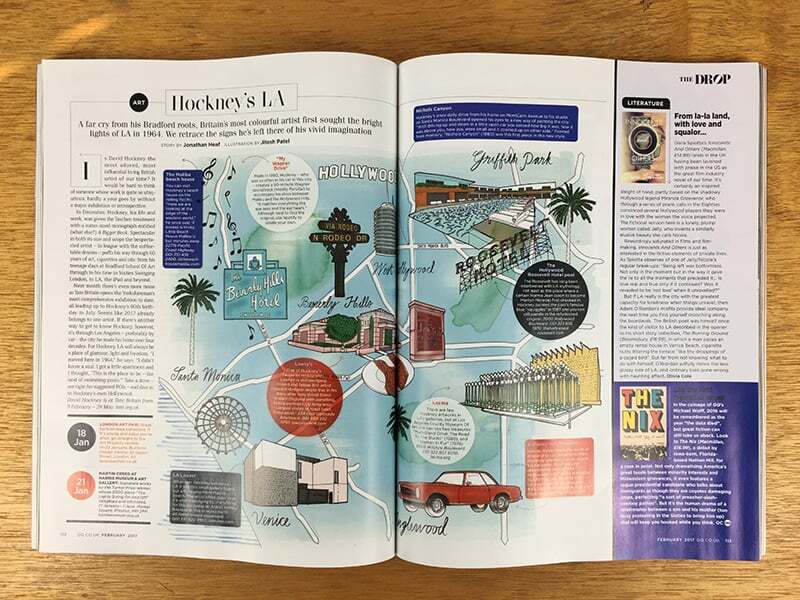 British GQ Magazine David Hockney Los Angels Map Drawing. I was approached by an editor for GQ magazine to draw a map of Los Angeles iconic sites. In addition to visual reference within the sketch of David Hockney sites – eg the Museum of Modern Art, LA Louver Gallery and The Hotel Roosevelt. LA has many well recognized stylized ‘LA’ typographic signage for example like the Beverly Hills hotel, Roosevelt, Hollywood the Hollywood Sign. LA Louver Gallery; where he’s exhibited in LA. My Wagner Driver – a recording he made for the drive from his house made up music that spirals and clashes.